A parliamentary report of 1777 recorded a parish workhouse in operation at Barrow for up to 30 inmates. The old Guildhall, a building dating from the 16th century, on the Street in Horringer (formerly Horningsheath) once served as the parish workhouse. 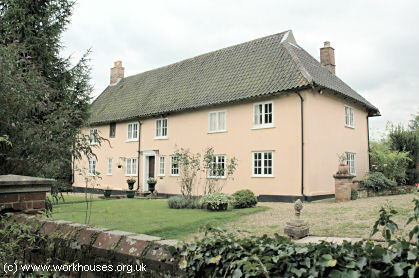 Horringer former parish workhouse, 2006. 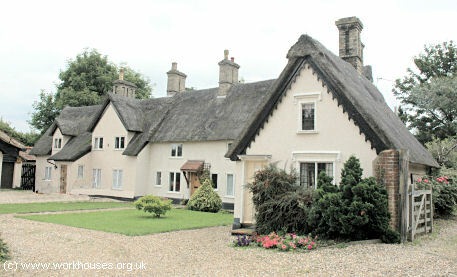 Hawstead, too, converted a former Guildhall for use as a workhouse. The 15th century house, formerly the Guildhall of St James, was located on Church Road. It became a workhouse some time in the 18th century. Hawstead former parish workhouse, 2006. Suffolk: Ampton, Bardwell, Barrow, Great Barton, Bradfield Combust, Bradfield St. Clare, Bradfield St. George, Brockley, Chedburgh, Chevington, Culford, Depden, Flempton, Fornham All Saints, Fornham St Geneveve, Fornham St Martin, Hargrave, Hawstead, Hengrave, Horningsheath, Ickworth, Ingham, Ixworth, Thorpe by Ixworth, Lackford, Livermere Parva [Little Livermere], Livermere Magna [Great Livermere], Nowton, Pakenham, Rede, Risby, Rougham, Rushbrook [Rushbrooke], Great Saxham, Little Saxham, Stanningfield, Stanton All Saints, Timworth, Troston, Great Welnetham, Little Welnetham, Westley, West Stow, Whepstead, Wordwell. Later Additions: Chimney Mills (from 1858), Denham, Hardwick, . The population falling within the Union at the 1831 census had been 16,916 with parishes ranging in size from Ickworth (population 43) to Rougham (1,113). The average annual poor-rate expenditure for the period 1833-35 had been £13,675 or 16s.2d per head of the population. 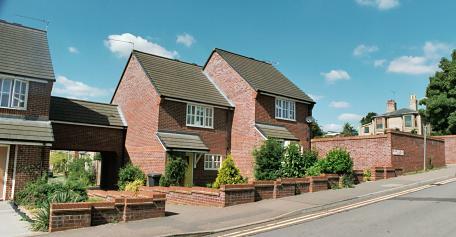 In 1836, a new union workhouse was erected at the west side of Mill Lane in Bury St Edmunds. It could accommodate up to 300 inmates and cost about £5,000. The workhouse layout was based on the unusual "St Andrew's cross" variation on the popular cruciform plan which can also be seen at Romford and Lexden and Winstree. The Master's quarters were located in the supervisory hub at the centre, with different classes of inmates accommodated in the radiating wings, Exercise yards were formed between the wings which were further divided by brick walls. There was an entrance block on Mill Lane which included an access archway. The sit layout is shown on the 1903 map below. The workhouse was enlarged in 1879 with the addition of a new committee room, board room, and casual wards, at a total cost of around £3,000. It could then accommodate about 380 inmates. From around this date, the Mill Lane workhouse received indoor poor and vagrants from the adjacent Bury St Edmunds Union. The Bury St Edmunds Union's College Street workhouse which was closed down and most of the property sold off. In 1898, the original school block was converted into an infirmary at a cost of £700. A new infirmary block for male patients was erected in 1912-13 at a cost of £3,604. In 1907, the Thingoe Union was dissolved and its member parishes taken over by a new Bury St Edmunds Union which had been reconstituted from the former Bury St Edmunds Incorporation. The Mill Lane workhouse later became St Mary's Geriatric Hospital which closed in 1977. Most of the buildings were demolished in about 1990. Most of the site is now occupied by housing, although part is still used by a sterile supplies unit. Thingoe former workhouse site from the east, 2001. Suffolk Record Office, 77 Raingate Street, Bury St Edmunds IP33 2AR. Very few local records survive. Holdings include Guardians' minutes (1865-1908).